Yes ,you heard it right . 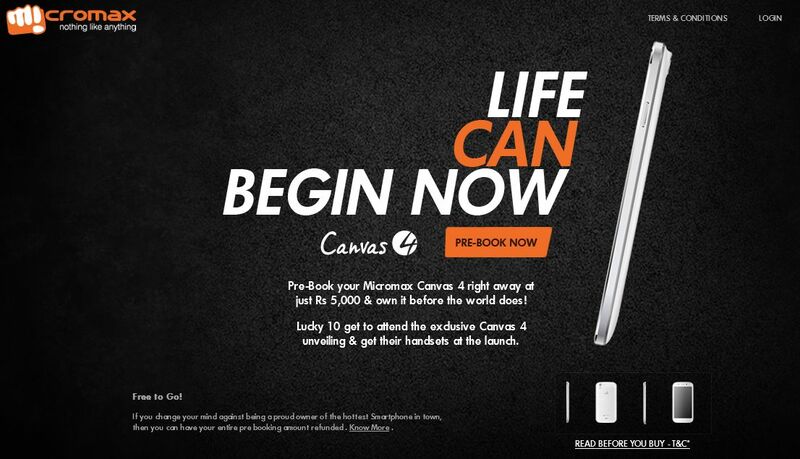 Micromax is actually trying to get you to pay ₹5000 for pre booking canvas 4 without any mention of specs or pricing . The news came as a shock to many customers who were waiting for the device from weeks and has caused huge disappointment . the actual release date is finally confirmed to be 8th july, the pricing and specs will be released on the launch day itself .The only good news is that micromax has promised to refund full pre booking amount if you are not satisfied with the final device.
" Pre book now by paying Rs 5,000. Remaining amount shall be charged later before the delivery of the product. No interest will be payable on the said amount for any reason for whatsoever. Customers will have a 7 day window after the 8th July i.e. till 15th July to pay the remaining balance @ www.canvas-4.com or to cancel the order. Post 15th of July, if the customer has not paid the remaining amount his/her order will stand cancelled and the amount will be refunded back to the account of the customer. Customers can get a refund by logging on to www.canvas-4.com and clicking on the refund tab. User can expect the refund to be credited back in to the account from which the initial payment was made within 7 - 10 working days from the date of application for refund. In case the refund is not reflected in the customer's account, customer to intimate the same on email and efforts would be made to trace payment. No interest will be payable on the said amount. Shipment of the product will start from 10th of July onwards and the product will be delivered within 7 business days thereafter. 10 lucky Customers who pre-book before 6th of July will get a chance to attend the mega launch of the Canvas 4 in Delhi on 8th July and will also get their booked unit by paying the balance amount. These 10 Customers will be chosen on the basis of a lucky draw. Micromax will not be liable for any travel expenditure/ costs involved therein for these selected customers. No employee of company or relative thereof would be eligible for the said lucky draw any such entries would be treated as void. " so what do you think about the release ?? ?